3 ft. 6 in. long, 6 ft. beam, 28 in. deep. 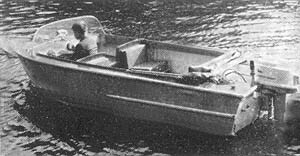 A single-chine runabout, capable of high speeds with a large motor but will plane with 15 H.P. This is a very roomy runabout and can have rear-facing seats for use when water-skiing. The hull has a moderate V bottom and is built upside-down on frames. Note the classic curved (tumblehome) transom.